Location: East of San Diego, near Alpine. Take Highway 94 east for 5.1 miles past the junction with Highway 125. Turn right onto Campo Road (still Highway 94) and go 4.5 miles to Lyons Valley Rd. Turn left and go 0.7 mile to Jamul Rd. Turn left and go 0.4 mile to the McGinty Mountain Preserve staging area on the right side of the road. 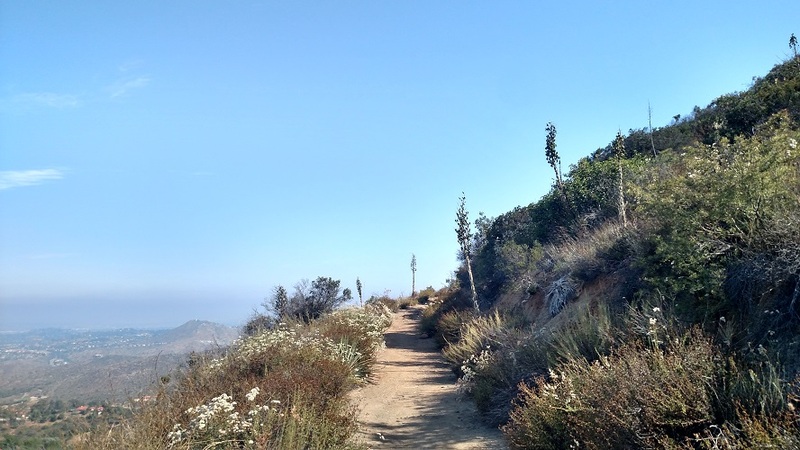 Located less than half an hour from downtown San Diego, McGinty Mountain’s steep slopes and panoramic views make it a local favorite. 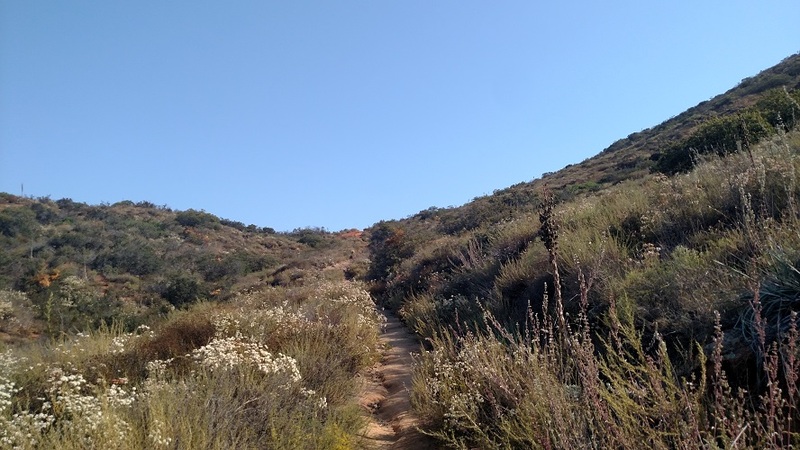 Even Orange County and L.A. hikers may find it well worth the trip, especially on cool, clear winter and spring days. Spring wildflowers include goldfields, buckwheat and yuccas; the peak is also home to several rare plant species including Dehesa beargrass and San Diego thornmint. The hike starts easily enough, but before you get your hopes up, know that the pointy bluff towering above you is not the summit; in fact it is not even halfway to the summit. The trail heads north through a shallow draw, soon making an ascent to a bench with views of some luxury homes to the north. The climb becomes more pronounced as the trail switchbacks up the western slope of a ridge, providing increasingly wide views. The trail is often narrow and rocky, making it feel rather rugged for a hike so close to civilization. Three quarters of a mile from the start, you reach a T-junction. Bear left and continue your ascent, now on a wider trail, to the top of the ridge visible from the trail head (0.9 mile from the starting point and more than 600 feet higher.) In the distance, you’ll see McGinty Mountain an the ominously steep trail leading up to it, but for the next 0.7 mile, you get a break as the route follows a gentle ridge line. Views include Sycuan Peak to the east and Sloan Canyon to the northeast, as well as a few dirt roads and scattered country homes. There are a few side trails but the main route is usually pretty obvious and well signed. At 1.5 miles from the start, bear right and briefly head downhill to the base of McGinty Mountain. 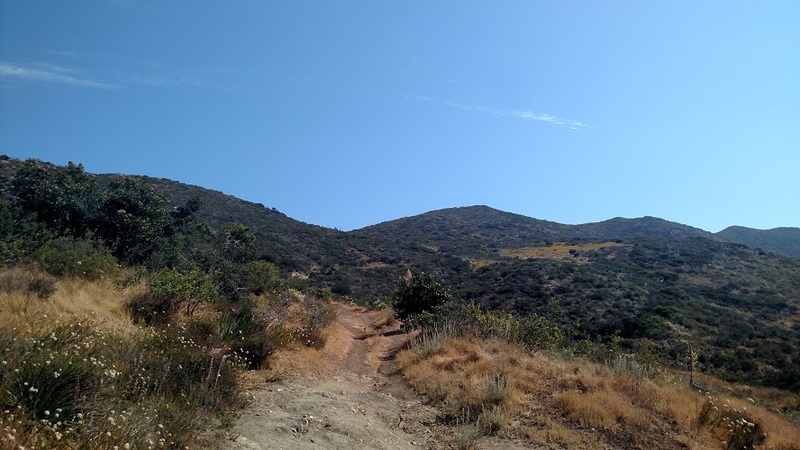 A leg-burning ascent of 250 feet in 0.2 mile brings you to a flat spot with views to the west, with the knob of McGinty’s summit dominating the landscape to the north. The trail then splits; the official route heads left, picking up about 200 feet in a quarter mile before arriving at a ridge just below the peak. A short scramble over some rocks brings you to McGinty Mountain’s elongated summit. 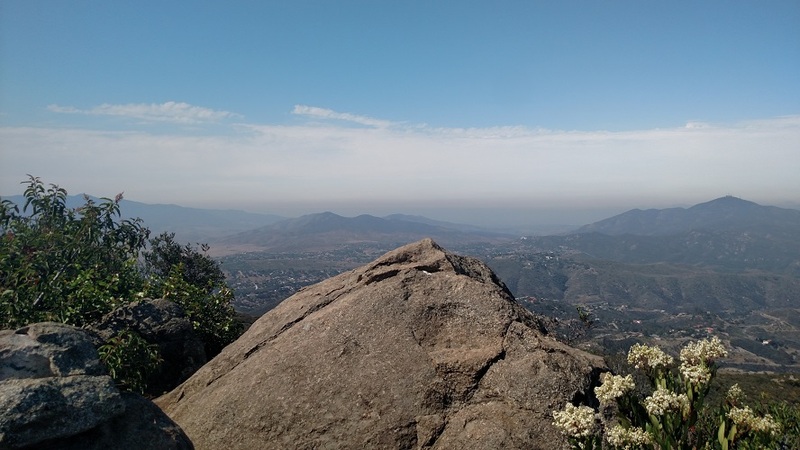 The impressive view extends south into Mexico, north toward Cowles Mountain and the other Mission Trails peaks and if visibility is good, west to the ocean. Even if clouds or fog cut down the distance of visibility, the nearly bird’s eye views of nearby Jamul, Alpine and Lyons Valley are impressive.